Featuring unique charms, beads, and knot work, this set of seven bracelets sprung from natural inspiration. With this collection of handcrafted bracelets, the whole earth and its history is right at hand to help you express yourself. 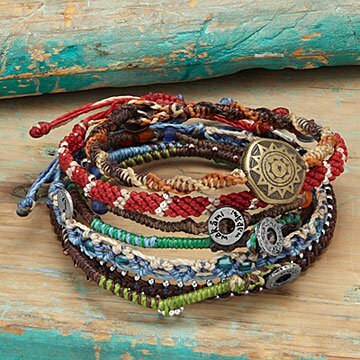 Each band has a unique combination of colors, charms, beads and decorative knot work, allowing you to find a symbolic meaning in each one. When you wear the twisting, autumn-toned band with its starburst pendant, for example, will you picture the sun and the earth, or intricate wonder of DNA? The bracelets can be mixed and matched, and worn individually or together to suit your look, your mood and your place in the world. Bracelets are made from durable, waxed cords, and have either button-and-loop or adjustable knot closures. Handmade in Guatemala. Lis Giròn believes everyone is born with creativity. She's inspired by the innate inventiveness of her inner child as well as that of the indigenous communities she works with. Lis loves to combine fashion trends with ancestral techniques from these rural Guatemalan communities, feeling there is something magical there that connects her with her inner soul. I really wanted to like these! They are beautiful and I really like how my purchase truly helps others who make them. Several of the bracelets can be adjusted with the strings pulled to the needed circumference, but others close with a button clasp and can't be adjusted. I have a small wrist, so several of the bracelets are too big for me. I was also surprised at how stiff they were, but maybe they will soften with more wear. I purchased this bracelet for a gift but did not end up giving it; it was a total waste of money and I would have been embarrassed to give it to anyone; the bracelets appear to be made out of a wire/metal that was all bent out of shape and did not fit on the wrist like a bracelet should; when I try to shape them they just keep sticking out in other areas, plus they barely fit on the average size hand and it could easily take 10mins to actually get them on your hand. The picture does not do it justice -- they look cheap. I was extremely disappointed and feel it was a waste of my money. I just couldn't even be bothered to return it. Not recommended. A sweet selection of bracelets in a variety of styles, colors and lengths. Nice bracelets, presentation could be a little bit better. The bracelets were very beautiful and well made. I just wish there would have been more of a description on the meaning of all of them, both individually and collectively. It was a gift.she seemed to like it. Nice unique gift; would give again. This is just a really nice set of bracelets. My granddaughter is pretty picky and she immediately loved them. Great quality and so unique! I may buy it for someone else. The story behind all this is fantastic. We like to do things that empower women.